This FIFA World Cup, the security has been really going well and yet no calamitous incident reported so far, other than the security company who is responsible to keep an eye on the event’s security, itself tweeted a photograph of their state-of-the-art monitoring centre that exposed the World Cup security centre's internal Wi-Fi password to the whole world. Israel-based security firm RISCO is providing security management at the soccer stadium and very proud of their incredible work in securing this year’s World Cup, which includes monitoring and maintaining hundreds of CCTV security cameras all over the 41,000-seat Arena Pantanal football stadium in Cuiaba, Brazil. 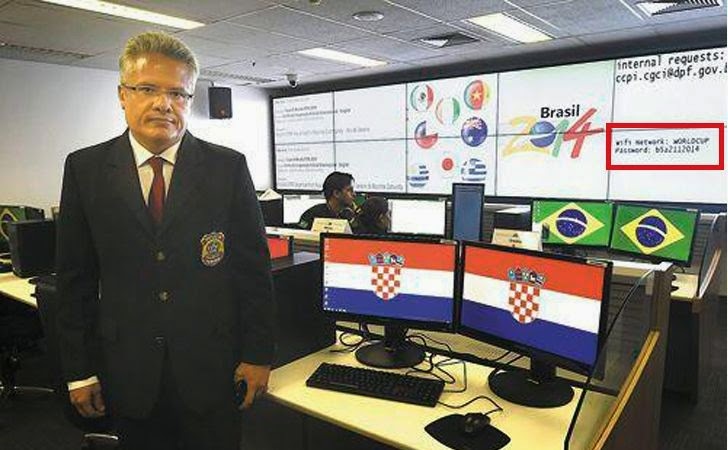 The image was originally published by news outlet Correio Braziliense, that showed the Federal Police's head of international co-operation Luiz Cravo Dorea, standing in the mulch-million-dollar security center overseen by Israeli company RISCO and was watching Live video feeds from surveillance cameras. The image was posted on Twitter and has been re-tweeted almost 3,000 times. The password appears to be "brazil2014" in leet speak. I think it’s completely unguessable and the most secure one for this highly considered World Cup event. Haaa! This accidentally leaked Wi-Fi Credentials from the Security Centre of the biggest game on the Earth could have given cybercriminals opportunity to carry out man-in-the-middle attacks to break into their network and compromise the systems. But, definitely after media updates, they would have realized their mistake and updated the WiFi SSID and password for the football World Cup's security center secretly.